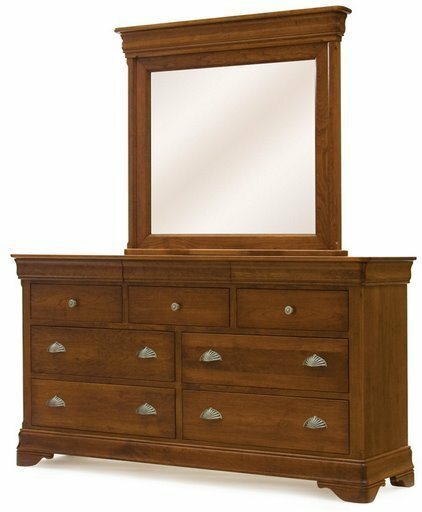 This Amish Furniture Bedroom Furniture Solid Wood Le Chateau Triple Dresser is neatly designed with clean lines and drawers that show off the smooth grain of solid hardwood wood. The drawers are dovetailed for years of everyday use. Give your bedroom the look and comfort of a village inn with the Amish Furniture Bedroom Furniture Solid Wood Le Chateau Triple Dresser. Our Amish handcrafted Le Chateau bedroom furniture pieces will be a beautiful addition to your master bedroom. This beautiful dresser has 3 hidden velvet lined jewelry drawers in the top crown molding. These jewelry drawers are the perfect choice for hiding your jewelry, money or other valuables. The optional Chateau Mirror also has a flip top lid that opens to store additional keepsake and money. The base is also lined with maroon velvet. Amish Furniture Bedroom Furniture Solid Wood Le Chateau Triple Dresser! This product takes about 8-12 weeks to complete.